For most of this time the cartoons have been born out of frustration and despair at the lengths individuals with slim talents and even slimmer grasp of ideas (let alone skills) would go to network their way into advantagous positions in the glorious I.A.W. This has been particularly galling here in Nottingham as both the local council and the arts council here (desperate for some credibility and clout after several decades of little interest in the fate of the arts) have seemingly combined to save all our artistic souls. So called ‘mid-career’ artists (polite euphamism for almost dead it seems) are being hogwashed with tales of cutting edge advances and a whole new generation of brilliant Trent graduates are about to break through big-time in the (you guessed it) I.A.W. Well I am so out of the loop with current I.A.W. parlance to comment but frankly they will have to chuck an awful lot more than the current £19 million and rising at this lot to do that..Why?.. Simply put you cannot create a ‘scene’ EVER. You can puff yourself up and say yes we have more graduates than Birmingham or Leicester or cite the occasional fluke success (Mr Starling did photography here NOT fine art – that he learnt at Glasgow School of Art but that may just be another inconvenient truth for the powers that be). So the shiny new shed (homage to John Newling?) with its colour co-ordinated green and gold exterior ( council colours ..what you hadn’t realised that??? perfect as a new Robin Hood Theme Park should art go west) is the gate to a new artistic dawn? Of course not and even the most deluded wannabe artist in desperate straits couldn’t quite believe that but there such slim pickings here these days that even that illusion is grasped like a nettle and hung on to…….tightly. It makes good business sense (illusions drive key performance indicators….especially graduate recruitment).Trent already spills out 100 plus creative geniuses per annum….Where do they all go?? ?….Well the dole seems a likely destination…and that just the start of the problem. There never was a bottonless pit of ever-increasing talent and parental finance to pay for this shiny future. Most of the newly enboldened middle classes hoodwinked themselves for a while into believing that all God’s children could work in the golden goose land known as I.A.W. but that dream has long since collapsed..fine art is not the new architecture…..or fashion come to that. These days even talented graphic designers and fashion students (ones with both rich parents and some amount of actual skills) are finding the moveable feast has long moved on. 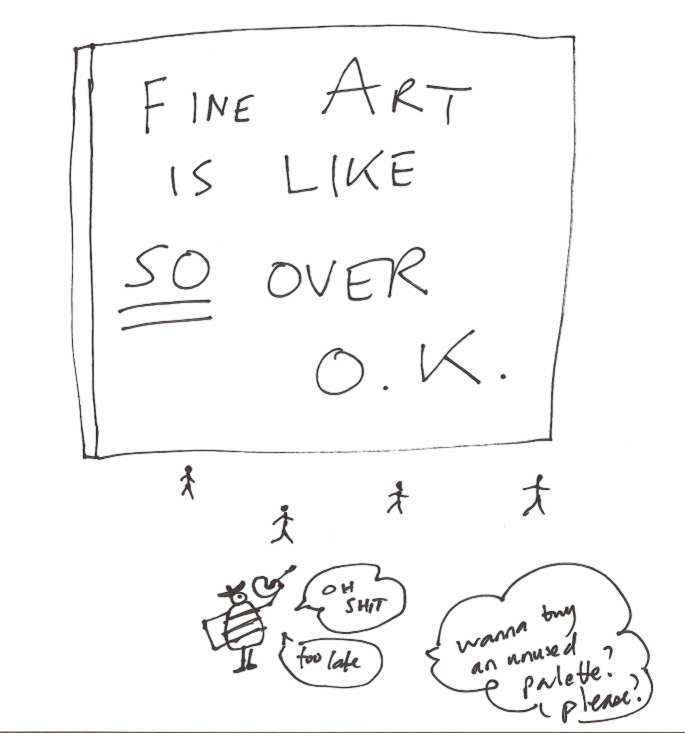 So what hope for frankly less able fine art graduates in these poorer climes? Banding together has paid dividends as groups mean points on those regeneration target wall maps..
Of course in a world in hock to sleasy developers the truth is an unecessary conceit we cannot afford. So we have the priceless sight of a American ‘radical’ artist giving us a lesson in how to be ‘rebellious’ with their stunning ‘installation’ in the ‘shop window’ of Nottingham Contemporary. Apparently this genius is critiquing the ‘capitalist baddies’ who run the state-sponsored satanic mills or car factories as we know them locally. Try telling that to a recently laid off Toyota employee with two kids to feed and a mortgage that four tyres and a couple of trollies bolstered by the foundation student level ‘black and white TV screen’ flickering in contemporary ‘stylee’ is a good investment. It is a business model and it is failing but no-one wants you to know that. Early interviews about the purpose of this palace of spin were defined by ‘marketing’, regeneration and hype…before boom became bust this glistening centre of the modern was to help drive up shopping..yes shopping……all those Texan Millionaires dissatisfied with Knightsbridge and L.A. would rock up in Snottingham (the gallery is opposite the original Snottingham cross ) and leave trails of cash like fat slugs all over our poor working class town……well that was until the I.A.W. collapsed and now even Sotheby’s are shedding staff like fleas shaken from a mangy dog. If they are in trouble imagine where the rest of us must be….. They have a good view of the gallery in the rain though…. That a fitting metaphor for these times…….underpaid call-centre employees staring out wistfully at the City of Dreams as they flog unpayable credit loans or administer foreclosing on some poor begger who cannot pay their council tax let alone the rent…. No I am not bitter or twisted I am a realist..a tired, disappointed and beside myself realist who one day may be accorded more respect for speaking out about fundamental matters instead of sweeping them under the carpet. Nothing matters more than politics…real politics….but nothing matters less than shiny towers decked out with spin. Let the party begin..let that out of work car-worker eat art…..
After all there is no cake left…. Previous Previous post: World’s Largest Henry Moore?